The goal of everything you do on Google+ should be to make lesser-known contacts, or virtual contacts, into better-known contacts to help market your company. Face-to-face interaction is the epitome of this type of strategy. When you’re dealing with communications inside your company (as you would for Google+) for Google Apps, face-to-face interaction is still the goal, especially if you’re in a large organization where it’s hard to get to know everyone. Some companies can get mired in red tape, departmental divisions, and other bureaucratic barriers. Opening communication across departments and throughout the company can improve teamwork, efficiency, and business processes. Assuming your company is set up with Google Apps, you can do this online magic easily by making posts targeted to your company’s domain on Google+. Start conversations that foster solving problems across departments. Especially in larger organizations, departments have difficulty talking with each other. Work can be duplicated, bogged down, or not even implemented. To unclog cooperation across departments, start conversations that get departments talking to each other. You can start with posts that target just your domain, and get employees talking and solving problems together. Any employee in the company can do this. Use circles to organize employees. Just as you can organize your normal Google+ friends in circles, so you can organize those in your organization into circles — and integrate them into contacts. Then the whole CRM process becomes a tool for internal business communication. You can get to know the people you work with and find ways to solve their needs better. After the event, make sure all the people you interacted with are in your Contacts and you’ve left notes to yourself in Google Contacts to ensure that you remember how you contacted them. 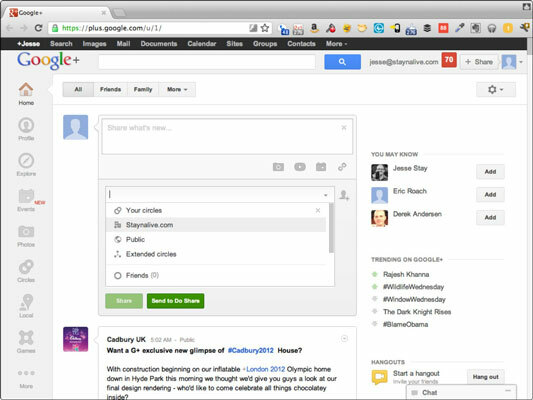 Organize regular Google+ Hangouts to encourage employees to get to know each other and solve problems together. As with regular Hangouts on Google+, you can organize Hangouts, at first allowing only those in your domain to join. This is a good was to get to know your fellow employees, share information, and collaborate on projects, especially if you work remotely. Use this opportunity to build relationships among your coworkers.